We are nestled in a corner of the beautiful North Devon coast line, close to the National Exmoor park. Nellies Nibbles was founded in 2016 named after my Nellie an Irish Soft Coated Wheaten Terrier. Having owned dogs some 30 years, Rottweilers & Irish Soft Coated Wheaten Terriers my passion for dogs & their wellbeing runs deep. After owning my own dog grooming studio and successfully showing my dogs for 25 years at Championship show level, I decided to hang up my show leads and follow my other passion, which I’m lucky to work within every day. I’ve always had an interest regarding dogs’ nutritional needs and after losing some of my Rottweilers 25 years ago, earlier in their life than expected due to cancer, In the back of my mind wondering if there was some sort of connection due to a combination of highly processed diet and the over use of flea/worming treatments & vaccinations but back in the day the research just wasn’t available for any of us to see as it is now. I was feeding some of the best kibble’s on the market for years, or so I thought. I was then introduced to the Barf diet (Biologically Appropriate Raw Food) many moons ago, I don’t mind admitting I found it quite scary & difficult. Info was in short supply, the internet information was limited. There wasn’t much in the way of meat availability with the variety you see made available today. I felt it difficult to get the DIY balanced, I was concerned I was depriving my dogs of all their correct nutritional requirements and a busy lifestyle didn’t make room for this. I dipped in and out feeding Kibble & Raw. Fast forward a few years……Raw feeding has never been so easy, I wouldn’t return to dried food for a million pounds! Having resolved some health issues and seen a huge improvement on a behavioural problem with one of my dogs. Plus I love the fact my dogs and many others have an amazing eating experience. Here at Nellies Nibbles Dog Larder we also promote the use of NATURAL remedies for treatment of Flea’s, ticks & worms. We support Titre Testing for immunity levels, so we don’t over vaccinate our beloved dogs. offering natural, holistic products and treats too. We’re passionate about supporting owner’s in their raw-fresh feeding journey, giving dogs what they are designed to eat and will offer you guidance & support should you feel you need it, whatever the stage you’re at. Even if your feeding kibble but would like to add a little fresh, we don’t Judge, we walk beside you and with support. You can find many answers to your question’s over at the FAQ page or why not join our Facebook Page. Your dog’s health & wellbeing is at the heart of Nellies Nibbles Dog Larder! 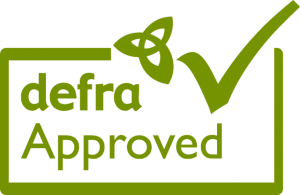 We are still currently Licensed with Defra as a Grain-Free Artisan Dog Bakery. Baking quality meat biscuits using only locally sourced human grade cuts of meat.